This week has seen the arrival on our shores of the first wave of Syrian refugees being re-homed in the UK, with some local newspapers going out of their way to provide a warm greeting. Alas, York daily The Press failed to match the generally welcoming tone with this rather unfortunate front page picture-headline juxtaposition. Subs used to stop this sort of thing happening. 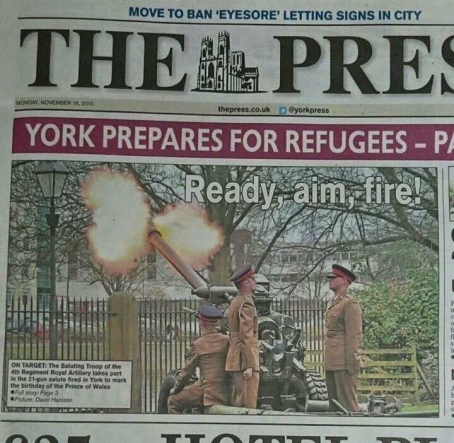 Remember them York? There again, especially since Paris the British public are not quite as welcoming to refugees as they once were. But you’re right about the lack of subs. Front page was done entirely in-house. Newport subs only saw it after the event. Just a thought, ‘…to clarify’. When you say it was done in-house, does that mean by trained subs? Eg, is there a retained subbing team in each centre? Or does that mean it was done by the news desk team, using template tools, but with no dedicated subbing experience. Because they are different skills. Presuming it’s the second scenario, don’t you think that the subs (in Newport) should have second sight of all pages for that reason? No wish to land the person responsible in it by saying anything that could identify them. But, a lot of centres choose to do their own front pages and usually it’s someone senior. Subs can see pages they haven’t worked on, and do sometimes spot things like this. But the ultimate responsibility for proofing pages lies with the centres. What’s the problem here? It probably gave the readers more enjoyment than the usual daily dose of ditchwater.